Workers’ Party Chairman Sylvia Lim crossed swords with Law and Home Affairs Minister K Shanmugam in Parliament yesterday over the proposed renewal of the Criminal Law (Temporary Provisions) Act (CLTPA). This is not the first time the two prominent politicians have clashed in Parliament. The Minister and the opposition chief have previously crossed swords in the House over the age of the new Attorney-General and, perhaps more famously, over the counting of the presidential terms that triggered the reserved Presidential Election last year. 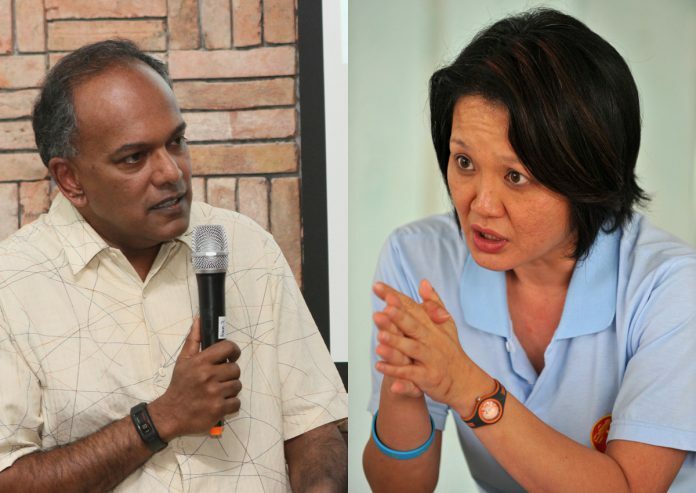 This time, Shanmugam and Lim contended over the CLTPA – a bill that allows for detentions without trial if the authorities deem such detentions necessary in the interests of “public safety, peace and good order”. The Act lapses every five years unless it is renewed. It was last renewed in October 2013, which was the 13th time the Act was extended since it was introduced in 1955. Parliament debated on whether the Act should be extended for the 14th time, for another 5-year-term, yesterday. Calling the proposal to renew the bill now “premature,” Lim said that she was “very surprised” that Parliament was called on to make a decision on renew the bill this month, when the Act only expires in October 2019 – about 20 months later. “Past debates did not have such a long timeline. Why is timing important? At each renewal, MPs are asked to consider the prevailing crime and order situation then, and to decide whether the extension is justified. “Today, Parliament is asked to assess the circumstances to justify the renewal of the Act from October 2019 to October 2024. How do we know what the situation will be like towards the end of next year? Things can always change. “Yes, the current Act does not list which kind of activities make a person liable to be detained. But that does not mean the Minister currently has carte blanche to detain anyone he pleases. “The Schedule will likely short-circuit the assessment process of cases suitable for detention, and maybe enable the Minister to bypass answering questions such as whether cases are serious enough, or why it’s not possible to prosecute these persons in court. “By linking the OCA to the CLTPA – is the new Schedule not expanding the Minister’s powers? “It’s not the case that if listed in the Schedule, you can automatically be detained,” he said. “So how does it increase the powers (of the Minister)? “What is the justification? The Minister keeps saying and saying the clause is not intended to change the legal position and it is meant to preserve judicial review. But it is a tenet of interpretation that Parliament does not legislate in vain. “If what the Minister is saying is correct – that the clause is not meant to change anything – then why introduce it at all? Why not leave it at status quo, instead of causing confusion and possible problems down the road about what this clause is meant to cover? “As a matter of law, this clause cannot oust judicial review and I buttressed it by saying to go ask any lawyer. Second, I’m prepared to stand up here and say as the Law and Home Affairs Minister that there is no intention to oust judicial review. “On the one hand, we know Singaporeans want Singapore to be a safe place to live in for ourselves and our families. “The current situation of law and order we have is based on the current legal framework we have, and if you remove the Criminal Law, or tinker with it very substantially, you will get some trade-offs in terms of increased levels of criminal activity.